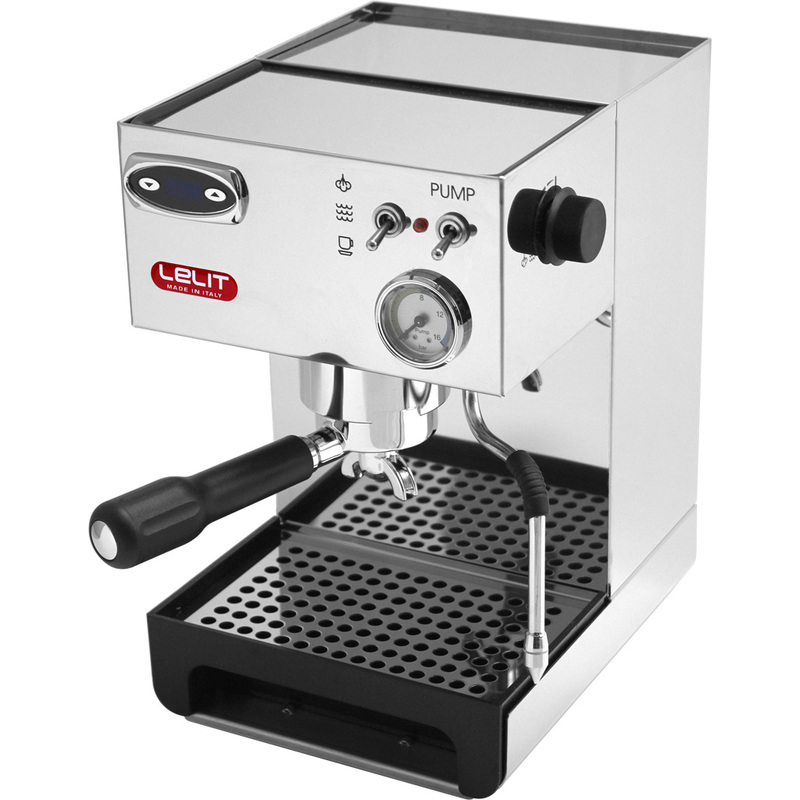 Steeping on the success of the PL41TQE, the PL41TEM has an added brew pressure gauge as well as different operational switches on the front panel. Brass – The small 250 ml boiler helps keep a constant water temperature and facilitate the espresso coffee extraction. High wattage heating element – 1000 watt heating element for quicker reaction time when cold water enters the boiler. Very quick warm up time – We clocked the warm up time for this machine (this includes the grouphead and portafilter when locked in) to be ~10 minutes. This is mainly due to the high wattage of the heating element and small size brass boiler. We found this to be very convenient for morning warm ups, especially when in a rush. Security thermostat and security valve – For better pressure control. Three-way solenoid valve – Allows immediate removal of the portafilter immediately after the espresso extraction has ceased (or when the pump switch in coffee mode is turned off). PID display – Allows the temperature of the boiler to be programmed for different coffees. Pressure gauge – Displays in real time the pressure during coffee extraction. Only 9-10 bar is needed to make espresso. This gauge will help perfect your espresso shot. Multi-purpose – Used for both steam or hot water depending on the current mode. Multi-directional – Enables you to prepare creamy cappuccinos. Very short wait time – The small boiler and high wattage heating element, combined with the PID controller cuts the wait time from coffee to steam considerably. Polymer tubing – The tubing that connects the boiler to steam / hot water valves are alimentary. They are able to withstand high pressure, withstand high temperatures up to 620 °F, facilitate easier repairs, and most importantly, are limescale free. Stainless steel body and frame – Polished to a mirror finish and rust resistant. Water tank visibilty – There is an opening on the left side of the machine that allows you to see the water level. This is a lot easier than opening the top cover and peeking in. Drip tray – The tray is made of plastic. The cover is made of stainless steel. Both are removable for easy cleaning. Power switch – Located on the back right of the unit. Not difficult to reach and keeps it out of the way of the rest of the main controls. Three way switch – Located on the front middle of the unit. Selects between the different modes. The up position is steam mode. The middle is hot water mode. The down is coffee mode. Pump switch – Located on the front right of the unit. Used t o activate the pump for coffee or hot water mode. Steam / water knob – Located on the right of the espresso machine. Allows you to control the intensity of the steam or water output. Portafilters – Dual spout portafilter. Filter baskets – 1-cup filter basket which holds approximately 7 grams. 2-cup filter basket which holds approximately 14 grams. Pod filter basket for use with E.S.E. pods. 57 mm in diameter. Coffee scoop – A simple plastic scoop if you are using preground coffee.